Ok, folks, let me explain what’s going to happen here today. I’m going to say a lot of nice things about a statue that most people will automatically hate on principle. I get it. The New 52 ruined your precious Harley Quinn because you hate her new costume. And this statue practically rubs your noses in it by its very design. I’m not being sarcastic… I really do get it. I hate what DC did to Zatanna in Justice League Dark. If DC Collectibles comes out with a statue of her wearing her new biker-chick pants and trampling on her old magician hat, I’ll be irked too. It is what it is. However, as someone who tends to not read many Batman books, Harley has never been a sacred character to me, and it isn’t until Suicide Squad that I actually adopted a book that she’s in as regular reading. I really love that book, and this is how she appears in it. Hence I really wanted this piece on my shelf. If hearing nice things about New 52 Harley is going to cause you distress, you might want to get off the train here and come back tomorrow. You’ve been warned! The statue comes in a pretty standard and boring box, similar to what we saw a few weeks back with the Cover Girls Catwoman statue. I’ve said my piece about how little I like DC Collectible’s package designs, so I’m not going to dwell on it here. Inside, the statue is wrapped in plastic and nestled between two styrofoam trays. The packaging is collector friendly and is handy to keep on hand if you ever want to put the statue into storage. Starting off with the pose… I really dig it. Harley is standing on one foot, bent forward a bit, while using her other foot to proffer a giant hammer to an unseen opponent. All the while she’s got a pair of blades in her hands and behind her back. I think the pose captures the spirit of the character pretty well. She’s playful, she’s crazy, and she’s going make a game out of killing you. The pose also helps to accentuate Harley’s assets… and her frontssets too! I find the sculpt here to be excellent. 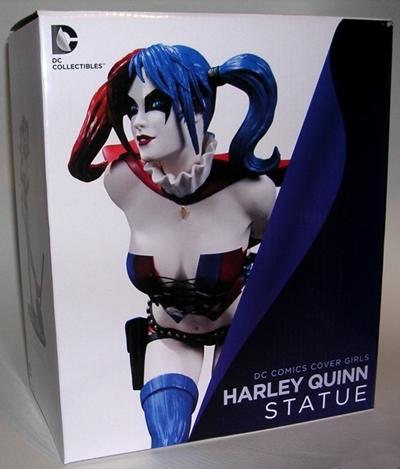 It probably helps a lot that I dig Harley’s stripper costume and it’s quite well executed here for a porcelain statue. Little touches include the loose straps on her pistol holsters, the bullets in her belt, the knit striping on her socks, and the loose lacing on her top. I’m particularly fond of the way her bangs hang over her face. A lot of the statues done in this media seem to have a problem with hair, but this one gets it right. The paint is competent enough, with just a few little flubs. There’s a little bleeding between the flesh and outfit, but a lot of the little details, like the bullets, look great. Her eyes are a little off, (what’s with DC Collectible’s inability to paint a pair of straight eyes?) but only a little, and the fact that the bangs hang down the way they do keep it from being a major problem. The rest of the paint on the face is quite sharp and looks nice. The red and blue used for her hair and costume is suitably vibrant and I appreciate the use of both matte and gloss in the appropriate places. So the base… yeah, that base. As already mentioned, it has Harley trampling her iconic costume. I think I get that DC was going for here. It’s a rebirth kind of thing In with the new Harley and out with the old. On the other hand, they really must have known that this was going to piss off a lot of fans. And let’s face it, Harley Quinn has a lot of fans. I can’t imagine there are many people like me who are following Harley for the first time in the New 52 and wouldn’t take this as a slap in the face. But hey, now I feel special… DC Collectibles designed a statue just for me. To add insult to injury, the trampled costume effect isn’t pulled off very well at all. It’s not terribly convincing and easily the weakest thing about this whole piece. Any way I look at it, I think it would have been best left out. The last Cover Girls statue I featured, Catwoman, was decent, but decidedly average. I’m a lot more pleased with this one. It’s a shame that it’ll be so controversial to fans because from a technical standpoint, I think DC Collectibles did a fine job on her. I was able to pick her up for around $70. That still seems a bit high, considering I can get something fairly comparable from Kotobukiya for less, but I’m guessing that’s the difference between cold-cast porcelain and PVC plastic. 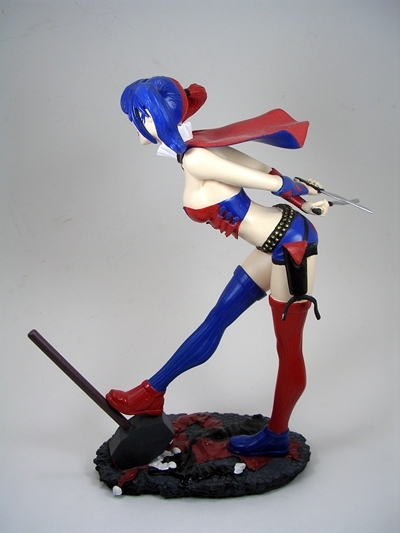 Obviously, this statue isn’t for everyone, but I’m glad to have picked it up and she looks damn fine on my shelf. Pingback: Episode One! The Geeks have arrived! | 2 Drunk Geeks and Ryan!